Emperor Jimmu (神武天皇, Jinmu-tennō) was the first Emperor of Japan, according to legend. His accession is traditionally dated as 660 BC. According to Japanese mythology, he is a descendant of the sun goddess Amaterasu, through her grandson Ninigi, as well as a descendant of the storm god Susanoo. He launched a military expedition from Hyuga near the Seto Inland Sea, captured Yamato, and established this as his center of power. In modern Japan, Jimmu's accession is marked as National Foundation Day on February 11. Jimmu is recorded as Japan's first ruler in two early chronicles, Nihon Shoki (721) and Kojiki (712). Nihon Shoki gives the dates of his reign as 660–585 BC. In the reign of Emperor Kanmu (737–806 AD), the eighth-century scholar Ōmi no Mifune designated rulers before Ōjin as tennō (天皇, "heavenly sovereign"), a Japanese pendant to the Chinese imperial title Tiān-dì (天帝), and gave several of them including Jimmu their canonical names. Prior to this time, these rulers had been known as Sumera no mikoto/Ōkimi. This practice had begun under Empress Suiko, and took root after the Taika Reforms with the ascendancy of the Nakatomi clan. According to the legendary account in the Kojiki, Emperor Jimmu was born on February 13, 711 BC (the first day of the first month of the Chinese calendar), and died, again according to legend, on April 9, 585 BC (the eleventh day of the third month). Both the Kojiki and the Nihon Shoki give Jimmu's name as Kamu-yamato Iware-biko no Mikoto (神倭伊波礼琵古命) or Kamu-yamato Iware-biko no Sumeramikoto (神日本磐余彦天皇). Iware indicates a toponym whose precise purport is unclear. Among his other names were: Wakamikenu no Mikoto (若御毛沼命), Kamu-yamato Iware-biko hohodemi no Mikoto (神日本磐余彦火火出見尊) and Hikohohodemi (彦火火出見). The Imperial House of Japan traditionally based its claim to the throne on its putative descent from the sun-goddess Amaterasu via Jimmu's great-grandfather Ninigi. The story of Jimmu seems to rework legends associated with the Ōtomo clan, and its function was to establish that clan's links to the ruling family, just as those of Suijin arguably reflect Mononobe tales and the legends in Ōjin's chronicles seem to derive from Soga clan traditions. Jimmu figures as a direct descendant of the sun goddess, Amaterasu via the side of his father, Ugayafukiaezu. Amaterasu had a son called Ame no Oshihomimi no Mikoto and through him a grandson named Ninigi-no-Mikoto. She sent her grandson to the Japanese islands where he eventually married Konohana-Sakuya-hime. Among their three sons was Hikohohodemi no Mikoto, also called Yamasachi-hiko, who married Toyotama-hime. She was the daughter of Ryūjin, the Japanese sea god. They had a single son called Hikonagisa Takeugaya Fukiaezu no Mikoto. The boy was abandoned by his parents at birth and consequently raised by Tamayori-hime, his mother's younger sister. They eventually married and had four sons. The last of these, Kamu-yamato Iware-biko no mikoto, became Emperor Jimmu. According to the chronicles Kojiki and Nihon Shoki, Jimmu's brothers were born in Takachiho, the southern part of Kyūshū in modern-day Miyazaki Prefecture. They moved eastward to find a location more appropriate for administering the entire country. 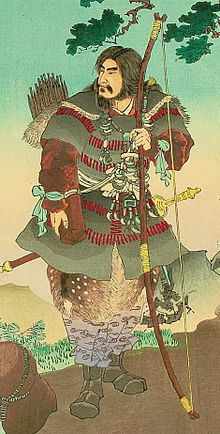 Jimmu's older brother, Itsuse no Mikoto, originally led the migration, and led the clan eastward through the Seto Inland Sea with the assistance of local chieftain Sao Netsuhiko. As they reached Naniwa (modern-day Osaka), they encountered another local chieftain, Nagasunehiko ("the long-legged man"), and Itsuse was killed in the ensuing battle. Jimmu realized that they had been defeated because they battled eastward against the sun, so he decided to land on the east side of Kii Peninsula and to battle westward. They reached Kumano, and, with the guidance of a three-legged crow, Yatagarasu ("eight-span crow"), they moved to Yamato. There, they once again battled Nagasunehiko and were victorious. In Yamato, Nigihayahi no Mikoto, who also claim descent from the Takamagahara gods, was protected by Nagasunehiko. However, when Nigihayahi met Jimmu, he accepted Jimmu's legitimacy. At this point, Jimmu is said to have ascended to the throne of Japan. Upon scaling a Nara mountain to survey the Seto Inland Sea he now controlled, Jimmu remarked that it was shaped like the "heart" rings made by mating dragonflies, archaically akitsu 秋津. A mosquito then tried to steal Jimmu's royal blood but since Jimmu was a god incarnate Emperor, akitsumikami (現御神), a dragonfly killed the mosquito. Japan thus received its classical name the Dragonfly Islands, akitsushima (秋津島). According to the Kojiki, Jimmu died when he was 126 years old. The Emperor's posthumous name literally means "divine might" or "god-warrior". It is generally thought that Jimmu's name and character evolved into their present shape just before the time in which legends about the origins of the Yamato dynasty were chronicled in the Kojiki. There are accounts written earlier than either Kojiki and Nihon Shoki that present an alternative version of the story. According to these accounts, Jimmu's dynasty was supplanted by that of Ōjin, whose dynasty was supplanted by that of Keitai. The Kojiki and the Nihon Shoki then combined these three mythical dynasties into one long and continuous genealogy. The traditional site of Jimmu's grave is near Unebiyama in Kashihara, Nara Prefecture. The Japanese historian Ino Okifu identifies Jimmu with the Han Chinese explorer and sage Xu Fu, who searched for the Philosopher's stone for emperor Qin Shihuangdi. Xu Fu reached Japan with over 3000 men and women and never returned. After his arrival the Yayoi period started. Veneration of Jimmu was a central component of the imperial cult that formed following the Meiji Restoration. In 1873, a holiday called Kigensetsu was established on February 11. The holiday commemorated the anniversary of Jimmu's ascension to the throne 2,532 years earlier. After World War II, the holiday was criticized as too closely associated with the "emperor system." It was suspended from 1948 to 1966, but later reinstated as National Foundation Day. Between 1873 and 1945 an imperial envoy sent offerings every year to the supposed site of Jimmu's tomb. In 1890 Kashihara Shrine was established nearby, on the spot where Jimmu was said to have ascended to the throne. 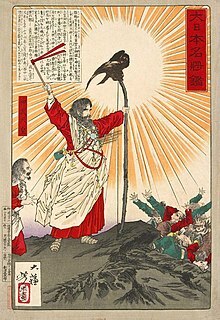 Before and during World War II, expansionist propaganda made frequent use of the phrase hakkō ichiu, a term coined by Tanaka Chigaku based on a passage in the Nihon Shoki discussing Emperor Jimmu. Some media incorrectly attributed the phrase to Emperor Jimmu. For the 1940 Kigensetsu celebration, marking the supposed 2,600th anniversary of Jimmu's enthronement, the Peace Tower was constructed in Miyazaki. The same year numerous stone monuments relating to key events in Jimmu's life were erected around Japan. The sites at which these monuments were erected are known as "Emperor Jimmu Sacred Historical Sites". This page is based on the Wikipedia article Emperor Jimmu; it is used under the Creative Commons Attribution-ShareAlike 3.0 Unported License (CC-BY-SA). You may redistribute it, verbatim or modified, providing that you comply with the terms of the CC-BY-SA.